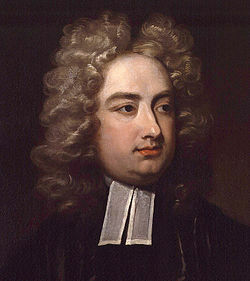 Jonathan Swift was born on November 30, 1667, in Ireland. Swift's father died before Jonathan was born, and the young boy's three uncles helped to raise and influence him. At 15, Swift entered Trinity College in Dublin, considered one of Ireland's best schools. 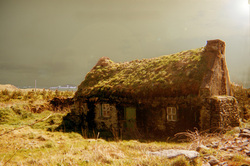 However, in 1689, civil, religious, and political unrest forced him and other Protestants to flee Ireland for England. "Every dog must have his day." 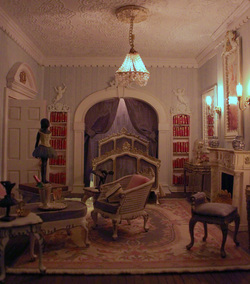 Swift began to work as secretary to Sir William Temple; at the former Member of Parliament's home, he was allowed to explore the influential gentleman's vast library and meet numerous important people. Swift also tutored a woman named Esther Johnson, whom he called Stella. It is unclear if they were merely friends or were secretly married, but Swift wrote his Journal to Stella (1710-1713) for her. Swift changed his political support from the Whigs to the Tories, who he felt were more supportive of the Anglican Church. He disliked the endless religious squabbling between various denominations over what he believed were insignificant differences as much as he detested political disputes and society's discrepancies. Although Swift called himself a “misanthrope,” his writings constantly reflect the belief that humanity could better itself. During his later years, Swift was thought to be insane, but modern biographers believe he suffered from extreme vertigo, which was complicated by difficulties from an earlier stroke. Jonathan Swift died in a mental institution, in 1745. "Gulliver's Travels." Enotes.com. Enotes.com. Web. 15 Mar. 2012. <http://www.enotes.com/gullivers-travels-jonathan-swift-text>. Satire: a literary device used to ridicule or make fun of human vice or folly, in individuals, ideas, society, and institutions, often with the intent of correcting, or motivating change, in the subject of the satiric attack. - Parody: It is a humerus imitation of style and subject matter that makes the original serious piece of writing or historical event look ridiculous. - Irony and Sarcasm: These two devices are often used by satirists in order ridicule the subject by meaning the opposite of what the words actually say. When reading this poem, it is important to understand who's elegy it is. The Duke of Marlborough was a General in the British army during the War of the Spanish Succession, and was dismissed shortly after Swift wrote and published a political pamphlet accusing the Duke of prolonging the war in order to make money for himself and other prominent Whigs. The Duke died a death of old age on June 16, 1722, and Swift wrote this poem shortly after. Yet Swift never published the poem. Swift died in 1764, and the poem was not published until 19 years after. - When do you as the reader realize that Swift is being sarcastic? - What lines allude to the Duke's military career? - Why does Swift keep referring to the fact that the Duke died of old age? - Explain the metaphor between the Duke's death and the candle. - How do lines 25- 32 broaden Swifts satire? This satire of the streets of London is geographically correct. Water from St. Sepulcher's Church in Newgate joined with the water from London's great cattle and beef market, Smithfield Market, and ran down Snow Hill until it eventually made it to an open sewer at Holborn Bridge. Not only does Swift satirize the streets of London, but look at how he describes the inhabitants as well. Poets, law students, Whigs, Tories, poor and rich are ridiculed. Swift describes London at all stages of the storm. 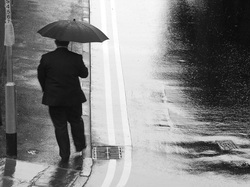 He builds the scene as the storm looms over head and his satire only sharpens as the poem continues. The last lines portray the most gruesome images as the filth of the city flows down hill. 1. How does Swift create an ominous tone in the beginning of the rainfall? 2. What are the stations of the people he satirizes and what flaws does he expose with each? 3. How is it that the Whigs and Tories are peacefully united? 4. How is this a Neoclassical poem? 5. Why does Swift end the poem with the description of what is flowing through the sewers? How do you solve problems of poverty, starvation, and overpopulation in Ireland? Satire of course. And Irony. Irony: it is when what appears to be contrasts with what actually is. - Verbal Irony: the speaker's implied meaning is the opposite of the actual meaning of the words spoken. - Situational Irony: the situation is the opposite of what would be expected. - Dramatic Irony: in drama or fiction, when the audience knows more than the characters do. So how is eating babies satirical or ironic? By the end of the proposal, it is clear that Swift is satirizing the English for their inability to improve the lives of the Irish people. He ridicules the government for being more concerned about reducing the number of papists than the number of uncared for children. He criticizes absentee landlords who tax their tenants into poverty and starvation. He satirizes women who are constantly having children that they can't provide for. "Foodies" are also criticized as they will create this new meat into an expensive delicacy for the rich. And he bores into fathers who treat their animals better than their pregnant wives, and mothers who would compete to bring the fattest baby to the market. Perhaps the most harsh satire is reserved for a government that has rejected all of Swift's previous, more plausible ideas. The irony in this proposal is mainly verbal. Swift does not actually think that this proposal will be taken seriously. Quite often he concludes that "I can think of no one objection that will possibly be raise against this proposal" (341). Obviously, Swift is using verbal irony. He hopes that the readers will be disgusted and outraged. After all, isn't that what satire is supposed to do? Perhaps the most biting verbal irony is when Swift states "Therefore let no man talk to me of other expedients" and then lists a number of plausible solutions for the deplorable state of Ireland (342). This is the list that Swift actually proposes for reform. 1. Why is "A Modest Proposal" not written as an essay? 2. What are the benefits to the plan? 3. Why does Swift write a page and a half before he actually announces his proposition? 4. How does Swift want to regulate the industry? How does he make sure that babies will remain a sustainable crop? 5. What is Swift's reasoning for making children profitable? 6. Why not eat teenagers? 7. What are the six supporting arguments? Who is Swift satirizing in each? 8. In this satire, how does Swift make his actual proposal? Among the exciting and amusing exploits that Lemuel Gulliver narrates, Swift satirizes society and the nature of man. Look carefully at the conversation between the King and Gulliver. As Gulliver praises the country of England, the King is a very keen observer and is able to find flaws. Here is satire of the government. The criticism of the government is one of the reasons that Gulliver's Travels was in such high demand immediately after publication in 1726. During the Age of Reason, man was considered to be a rational animal. Reason made man able to function in society, and it separate him from the animals. The animal aspect of man included emotion, physical needs, and impulses. Humans are then situated on a scale between higher human beings and lower human beings. A lower person would then be only concerned with meeting their physical needs and desires, and would act without reason. Reason is what would civilize a man enough to make him a higher person who would use reason to guide his actions instead of impulse. So how is Gulliver portrayed in "A Voyage to Brobdingnag?" Is he being treated like a rational animal? Is he a lower or higher being?